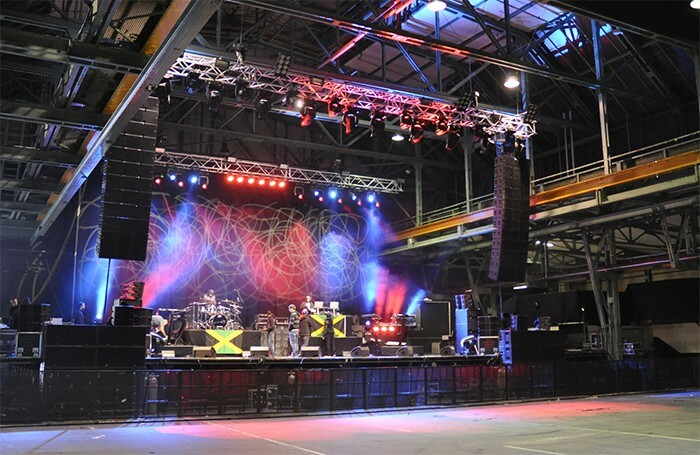 Popular international reggae star Sean Paul recently toured Germany with an Adamson Energia E15 line array PA provided by Hamburg, Germany-based COBRA sound light. The compact, 10-date tour took place in arenas across the country. COBRA sound light, a full-service provider for pro audio and event technology equipment, recently added the Energia E15 PA for its sound quality, scalability and simple rigging. "The tour was very compact -- Sean Paul played at 10 venues in 12 days with seating ranging anywhere from 3,000 to 7,000," explains Michael Buchner, partner at COBRA sound light. "It was important that the system be flexible and scalable. Fortunately we had just added the E15s to our inventory, which were exactly what was required." The tour travelled with 24 E15 line array modules powered by eight Lab.gruppen PLM 20000Q amplifiers. The size of the left-right arrays varied depending upon the size of each venue and the amount of audience area to cover. "The clarity and loudness of this line array system is superb," Omatali "Tali" Beckett, FOH engineer, says. "The sound of the box is amazing. I didn't experience any ear fatigue even after mixing at 95 dB – 100 dB for an hour – truly genius engineering." The E15 is a 3-way system, with two 15-inch neodymium Kevlar cone drivers, two 7-inch Kevlar cone drivers, and two 4-inch Adamson NH4 compression drivers. Frequency response is 60 Hz to 18 kHz, horizontal dispersion is 90 degrees, and vertical dispersion is 6 degrees. "When the tour promoter gave me the choice between an L'Acoustics K1 and the new Energia system from Adamson it was a no brainer for me," adds Robert Stewart, production manager for Sean Paul. "Everyone loves the system and I hope we have a chance to use it again after Sean releases his new album." Use of Adamson's Shooter software facilitated the use of the system in each venue. The predictive software provides a quick way to achieve a balance between speaker placement, vertical coverage and equal SPL throughout the room. "The Shooter software really simplifies set-up from venue to venue," adds Buchner. "It is easy to get the the system up and running and then optimize it for the room quickly and easily." COBRA sound light also provided a Digidesign Venue Profile at FOH and a Yamaha PM5D-RH at monitor for the Germany tour. "I can't say enough about the Energia E15 line array," concludes Buchner. "It sounds fantastic, is easy to use, and provides tremendous SPL and excellent coverage. We couldn't ask for more from a line array." In picture: Adamson Energia E15 line array rig in place for Sean Paul concert.